When it comes to air filters, most replaceable filters for the engine air intake, or spin-on air filters for the air brake system, are likely to be on a regular maintenance list. But what about in-line air filters for the trailer air system? Some trailer brake systems will have in-line filters designed to screen out debris headed toward the trailer ABS modulator and other valves. These valves are mounted in line with the air piping which more or less places them in and out of sight, out of mind position. That is until problems materialize anyway. So, what might problems with these filters look like? The most common issue will be a delay in brake actuation when applying brakes. This, of course, is the result of the restriction in the airline from the plugged filter. Also, be aware that these filters are directional. In some cases, they can be installed backward which may not restrict airflow but bypasses any filtering capability. 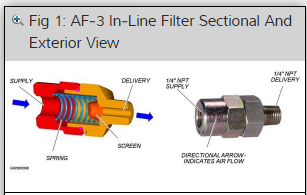 While not a regular service item, in-line filters do require periodic inspection. Your truck service information resource, like TruckSeries from Mitchell 1, will help you determine how often these filters should be inspected, as well as provide inspection and replacement procedures. Next:Buying New Tires? Check That Date!